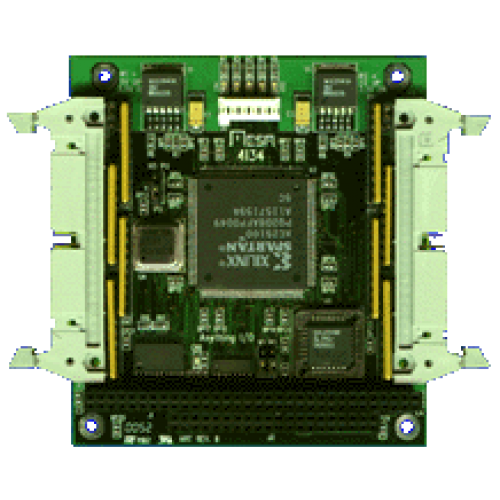 The MESA 4I34 is a general purpose programmable I/O card for the PC/104 bus. The 4I34 uses a 100K or 200K gate Xilinx FPGA for all logic, so it is truly an Anything I/O card. 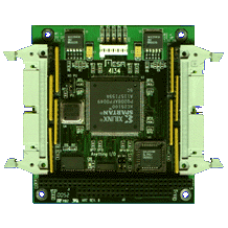 The FPGA is downloadable from the PC/104 bus side, allowing creation of almost any kind of specialized I/O function, including micro-controllers in the FPGA. Several pre-made functions are provided, including a 64 channel event capture card, an 8 channel host based servo motor controller, a 4 channel micro-controller based servo motor controller (micro-controller CPU built into FPGA), and a 8 channel, 32 bit timer counter card capable of running at 100 MHz. VHDL source is provided for all examples. All I/O bits are 5V tolerant and can sink 24 mA. Pullup resistors are provided for all pins so that they may be connected directly to opto-isolators, contacts etc. The 4I34 is available in 2 versions, the 4I34 with 64 I/O bits and the 4I34M with 48 I/O bits. The 4I34 uses two 40 pin connectors with proprietary pinouts, while the 4I34M uses two 50 pin connectors with I/O module rack compatible pinouts and interleaved grounds.